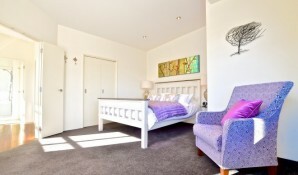 Speargrass Rise provides modern, stylish and attractively designed accommodation. 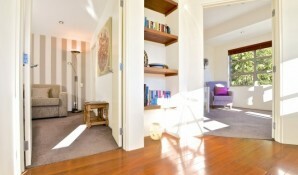 The first floor of the homestay (Coronet Suite pictured above) providing your own private retreat throughout your stay. Free bottle of wine on arrival. Free bike hire (subject to availability). Please note not all dates are released to online booking sites so please check availability directly with Speargrass Rise. 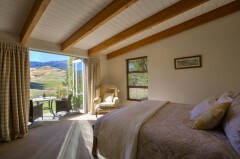 The Master Suite is luxuriously appointed with a quality queen bed, silk cushions and window seat on which to relax. 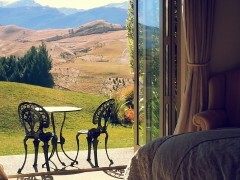 Enjoy the fabulous mountain views of Coronet Peak and the rolling hills of the Wakatipu Basin or maybe just sit and read a book. The first floor accommodation also provides a lounge with sofa, fire, flat screen tv and entertainment system for your own private use. There is a good selection of films in our dvd library and specially selected books to entertain you before bed. If you have children or are travelling in a group of 4 then just pull out our double mattress sofa bed. 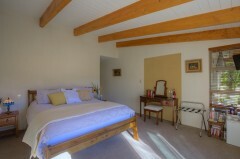 Alternatively we can have 2 single beds set up in this room for you. The Coronet Suite also provides a private en suite with bath and shower, heated tile floor and heated towel ladders, luxurious towels, robes and hairdryer. The Crown View Room provides spacious accommodation with luxurious furnishings on the ground floor of the property. The quality and comfort of the king size bed will help you relax during your break. The room with private en suite shower has magnificent mountain views and provides its own outdoor seating area with direct access onto the garden. It is only a short distance to enjoy the benefits of the spa pool (take a glass of wine and star gaze). 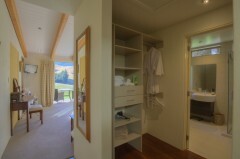 The room benefits from tv/dvd player, tea and coffee making facilities and mini fridge (Crown View Room pictured to the right). Breakfast can be taken outside during the summer months or delivered to your room or in the dining room year round. Either relax in your own private space or join us. The choice is yours. In the winter a roaring log fire awaits your return from the ski fields. In the summer just relax and watch the sun set behind the mountains with a ‘sundowner’ on the terrace and then wait to star-gaze. Whatever the season you can indulge in the spa pool, sip the local pinot noir and admire some of the most spectacular scenery in the world. We prepare you a delicious home cooked breakfast each morning which is included in the tariff if the breakfast option is chosen. Enjoy breakfast at your leisure either in the dining room or alfresco whilst enjoying the mountain views or have a continental breakfast delivered to your room... the choice is yours. Collect your own eggs from the chooks. Breakfast doesn’t come any fresher. Share a fun evening with us with complimentary drinks on the patio to discuss the activities of the day and your plans for tomorrow. Or be tempted by our wood fired pizza evening. We will fire it up, you roll the dough, you choose the toppings and bake the pizza yourself! Its fun! 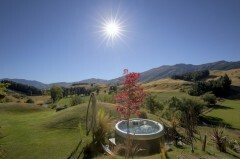 Summer or winter (by prior arrangement $65 per person to inc glass of wine and dessert). Or why not let us provide you a gourmet picnic hamper that you can take out for the day on your walk or cycle route. As your hosts we try to be attentive without being intrusive. Come and go as you please. You can be assured of a warm welcome and a memorable stay. 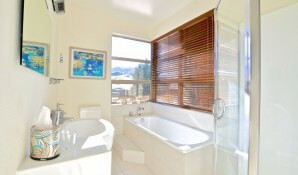 For more information and to book this Queenstown accommodation at the best price, contact us direct.